Well, SpaceShipOne lived up to its name and today became the first private spacecraft to leave Earth’s atmosphere and venture into the void of space. Has Burt Rutan ever designed an aircraft that didn’t work? If so, I can’t think of it off the top of my head. From general aviation aircraft to business turboprops to spaceships, he whips up a clean sheet design to accomplish a mission and always comes away smelling like a rose. In all fairness, not every Rutan designs have been financially successful, but that’s never been his goal. 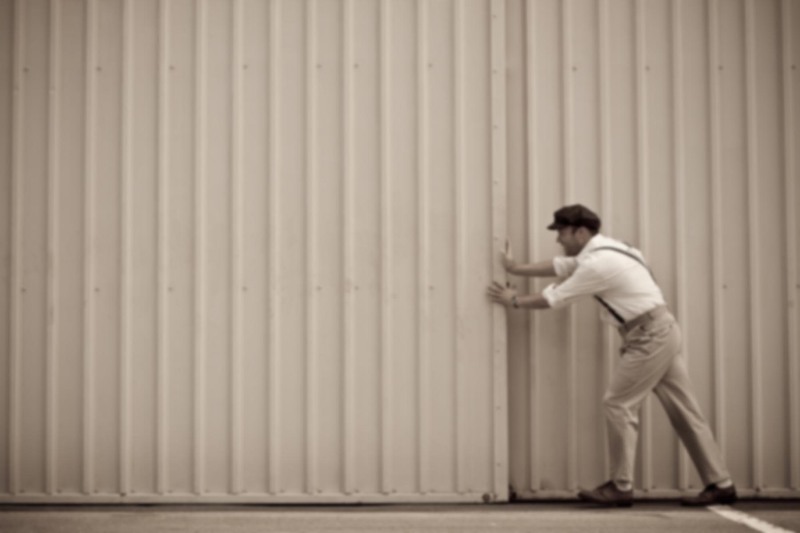 Besides, commercial success is largely predicated on regulatory and marketing issues. To the best of my knowledge, all his planes have met their design goals. And how lofty they are! I had always thought Voyager would be Burt’s crowning achievement. In retrospect, I think he was just getting started. I don’t think Mike holds an engineering degree–in fact, I don’t know if he graduated from college at all. And at 63 years old, he epitomizes the defiance Burt Rutan has for conventional wisdom. Of course, this is not to say Mike isn’t qualified. Quite the contrary. But at 63, he’s old enough that the FAA’s regulations would not allow him to fly a commercial airliner. 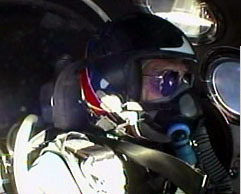 Yet he was selected from among the finest test pilots and engineers to be the first private astronaut. I can’t help but think of it as a subtle commentary from Burt on Yet Another Stupid Regulation. As I recall, Mike and his wife Sally came to Mojave from a Midwest machine shop in the 1970’s. He built a couple of early Rutan designs and started to work with the Burt back in the RAF days, quickly becoming his right hand man. Mike’s been at it ever since, and the resume he’s built over the years is every bit as impressive as any test pilot from Edwards or Patuxent River. What an amazing feeling it must be to recieve the first set of civilian astronaut wings. For at least a few days, Mike Melvill will stand alone as the only member of what will one day become a very crowded class of spacefaring Americans. And no matter how commonplace that journey into space becomes, history will record that it all started with him. Wow. My dreams for space aren’t dead after all. So when will I be able to retire on the moon? The moon is a long way off. Which is odd because we’ve been there before. But that’s how it is. 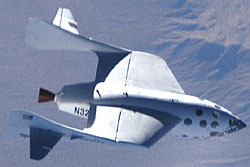 SpaceShipOne was a suborbital flight of short duration. That means slow speed, light weight, and no need for precautions against radiation, cabin CO2, thermal damage on reentry, etc. We’ll need to solve all that–and much more–before we go to the moon regularly. But if you want a first-hand view of what the earth looks like from space, that’s probably going to be available in the not-too-distant future.